The days are getting longer and the extended forecast looks mild. Spring is definitely on its way to NW Ontario. The way it looks right now, I'll guess it's not going to be a late ice out year. (** EDIT - April 11th - As the forecast has changed, my revised guess for ice out on Lac Seul is May 12th. With opener on the 18th, it's looking like it will in fact be a close one! **) We have a lot of snow too, so hopefully that leads to high water on Lac Seul. Despite the signs of spring, we still have plenty of ice fishing left. The best ice fishing of the season in fact. Here's a few highlights from the season so far. I still get a kick out of seeing my writing come to life in the pages of Ontario OUT OF DOORS magazine. I've had a handful of articles over the last few issues and even landed another cover shot on the Jan-Feb issue. My Sioux Lookout destination feature in the 2019 Fishing Annual was a fun one to write as I was able to showcase the incredible fishing we have here in my hometown. After running the Helix 9 on my guide boat at Winoga last season, I knew I had to have one for my own boat. This unit features Mega Down and Side Imaging and of course AutoChart Live, which is mind blowing. If you haven't seen AutoChart Live in action, you owe it to yourself to check it out! Total game changer! Long overdue update here folks, sorry about that. It's hard to believe another season on the water has come to an end. It's snowing in Sioux Lookout today and the mercury is well below freezing. Won't be long till ice fishing season is here! It was a great year on Lac Seul for me and my guests. My muskie obsession only grew bigger with a record setting year for numbers of fish boated. Thanks to everyone who fished with me in 2018. Here's a sample of some of the pics from late summer and fall. Also had the pleasure of hosting famed muskie angler and TV personality Pete Maina back in September. Pete was filming with Sunset Country Tourism and made a stop at Winoga Lodge to fish Lac Seul with myself and Troy. We had a great 'trip' and I'll be sure to share the video once it's released. Here's a snapshot of Pete and I with one of the fish we boated. It's always cool to see my writing come to life in the pages of Ontario Out of Doors magazine. It's even better when friends are featured on the cover and in the pages of my article. Check out these shots from the Fall 2018 issue. 2019 is already shaping up to be a busy season. Dates are filling up fast, so get in touch with me ASAP if you're interested in a trip. Ice fishing packages are also available for this winter. Check out www.Winoga.com for more info. Like most muskie fishermen, I'm also a tackle junkie. 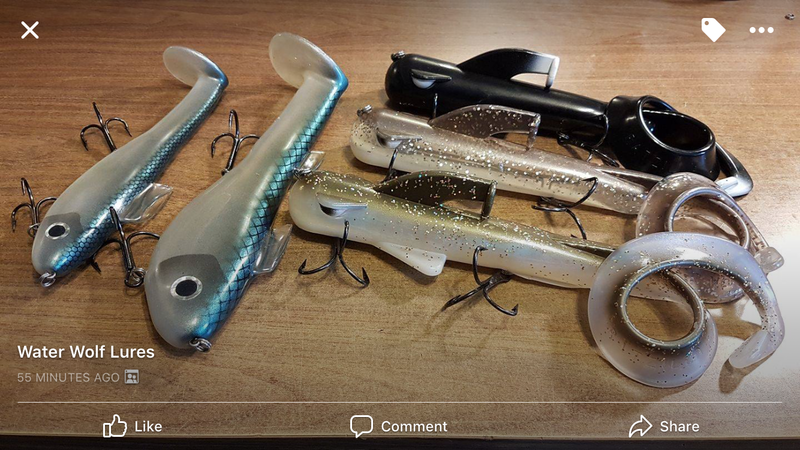 I love trying new baits and here's a couple I'm really excited about. On the left is a Trofik 5. This trolling bait is fully custom and handmade in Ontario. On the right is a Blue Water Bait Dive-and-Rise prototype. This thing is big and badass! Blue Water Baits have been hot ticket trolling baits for years and I'm lucky enough to demo the dive-and-rise. Can's wait to get both of these in the water and put them in front of some Lac Seul giants! Last but not least, be sure to grab a copy of the August 2018 issue of Ontario Out of Doors magazine and check out my muskie column. Here's a sneak peak! The first couple weeks of the season flew by up here on Lac Seul. We started with summer weather in May and then June kicked off with a big cold front. The warm spring had the fish very active and spread out almost everywhere you tried. Fishing was great for walleye, pike and bass. The cold front dropped temperatures over 10-15 degrees and the fishing slowed down a bit, especially in the shallows. The cold front is over and the forecast looks good going into June. The countdown to muskie season is definitely on now! I heard from a reliable source that the route from Deception landing to Chamberlain narrows is ICE FREE as of today, May 15th. I know for sure that ice remains west of this route. The central basin between Windigo Pt. and Eagle Island is always the last to go out. A few more days and it'll be ice free there too. Good luck to everyone fishing opener on Lac Seul. ​I have a few June openings for walleye and select dates in July/August for Muskie only. Get in touch if you're interested in booking a trip. I've been getting a lot of emails and message about ice conditions. A lot of guys are worried about their opener trips, and rightfully so. My earlier prediction of May 12 for ice out isn't going to happen. At this point I'd put it at 50/50 for ice out by Opening Day (May 19th). There will definitely be fishable areas wherever there is current, but getting to the north shore of Lac Seul (Bear Narrows, Chamberlain Narrows etc.) is unlikely, in my opinion, as this point. Things could change and we do have some high temperatures and rain in the forecast. I'll try to post another update in a week or 2. It's almost April, but there aren't many signs of spring in Northwestern Ontario yet. I know some of you watch my website for ice out predictions and right now all I can say is NOT EARLY! The long range forecast isn't favourable for melting ice either. I'm going to set my ice out prediction at May 12th. It's been a great winter for ice fishing with friends and guests at Winoga Lodge. We've been chasing lake trout pretty hard and have several big catches to show for our efforts. Walleye limits have been coming nicely as well. Here's a sneak peek at the lead page for an ice fishing article I wrote for Ontario OUT OF DOORS. As always the editorial team does a great job with these articles and Tamas, the art director, makes them look fantastic. Even though we still have a few weeks of ice fishing left up here I'm already thinking about summer. My schedule is nearly full but I have some walleye trips available in June and a handful of muskie dates later in the season. Shoot me a text, email or give me a call to set something up. ​Winter is here to stay in NW Ontario. The lakes are locked up and we've had snow on the ground for over a month. I'm still holding on to my buck tag, and that's the only thing holding me back from completing the transition to ice fishing season. We're taking bookings for ice fishing trips right now at Winoga Lodge. We've got some great dates available, so get in touch with me to set something up. I'm excited to be running new electronics on the ice this winter. The Humminbird Helix5 G2 GPS/Sonar combo is going to be a nice addition. Onboard mapping means all the same maps and waypoints from my boat and the ability to choose between flasher mode or regular graph mode (or run both side-by-side) makes this unit stand above the competition. Another exciting equipment addition for 2018 is a brand new snowmachine. 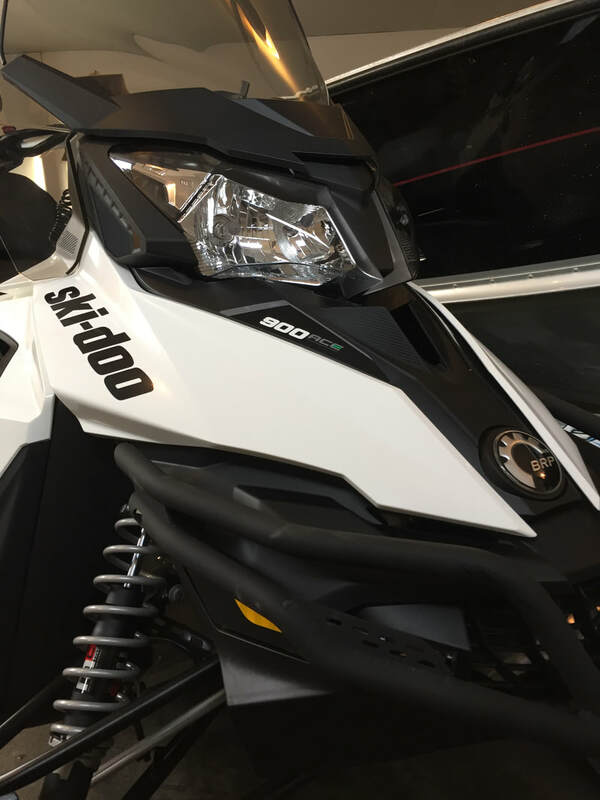 I went with a Ski-doo Expedition Sport 900 ACE. After a lot of research I have no reservations about making the jump to a 4-stroke. The 154x16x1.5 track is going to get me where I need to go through deep snow or slush pockets. 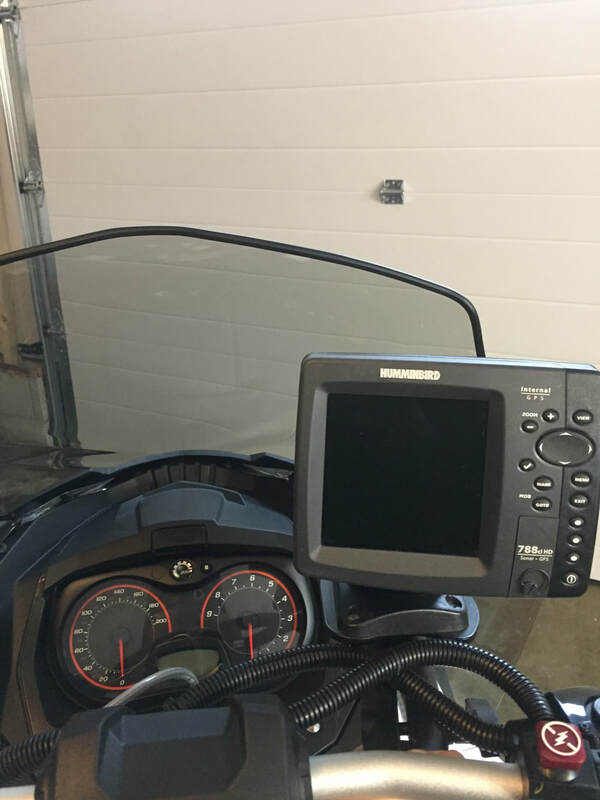 The Humminbird 788 from the bow of my boat is going to be doing double-duty as a mapping/GPS solution on the new sled. Can't wait to have all my waypoints on a heads-up display on my snowmachine. ​It's also worth mentioning that my summer 2018 schedule is filling up faster than it ever has. I have some June walleye dates available and only a few opportunities for muskie in late June, July and August remain open. So if you're thinking about booking a trip I'd suggest getting in touch with me asap. Email, call or text - all my info is here on the Contacts page. Of course I'm still thinking about muskie fishing even though the season is done. Can't wait to get my hands on these new Ratzillas from Water Wolf Lures. These will go nicely with their Shadzillas to make an unbeatable 1-2 punch for big rubber baits. Thanks for the continued support of benbeattieoutdoors.com The next update should feature some of the early season ice action from NW Ontario... and if I'm lucky and nice whitetail buck! What's not to like about fall?? Opening hunting seasons and the biggest Lac Seul muskies. It makes it hard to decide if you should be in the woods or on the water. Such tough decisions! First things first - I drew my first bull moose tag in 9 years so filling that was a priority. Thanks to my partner at Winoga Lodge, Troy Mansfield, we got it done. It's far from a monster bull, but it was an exciting hunt that ended up filling our freezers with the best meat you can get. Ontario OUT OF DOORS magazine continues to feature my writing. I'm proud to share the Pike & Muskie column with my buddy JP Bushey. Here's a snapshot of my fall column "Casting Big". This is especially cool for me because of the lead picture with 2 of my best buddies, Graham Coulombe and Mike Battistoni. I've also got into doing my own European Mounts. My moose is whitening right now and earlier I finished a bear and a wolf. Check it out - it's fun to do and I think they look awesome. Last but not least - muskie fishing! It's been an awesome fall so far and it's not done yet. November 8th is my last day with clients for the fall giant hunt on Lac Seul. A couple weeks ago I set a new personal record for biggest muskie in my boat. Client Dave Fowler hauled in a super tanker FIFTY FIVE inch giant! What a thrill. I'm reasonably certain I was more excited than Dave was. Ben Beattie is a fishing guide and outdoor writer living in Sioux Lookout, in northwestern Ontario.